Cut the ciabatta lengthwise and drizzle with olive oil. Roast in a hot pan, oiled side down, for approx. 3 - 5 minutes. Meanwhile, cut mozzarella and tomato into thin slices. Cut antipasti (e.g. artichoke hearts, grilled peppers) into bite-sized pieces and heat briefly in a pan. Next, spread the pesto onto the bread and place alternating layers of tomato and mozzarella slices on top. 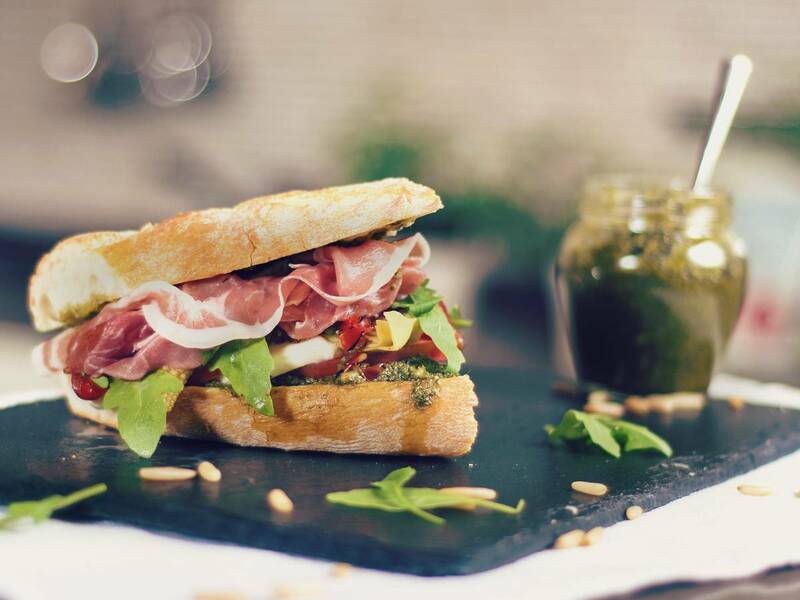 Place the antipasti, prosciutto, and the arugula on the ciabatta. Place another piece of bread on top. Pierce with a wooden skewer to to make the sandwich easier to serve and eat.